When I was in the classroom, I always wondered how much of an impact I would make on my student’s lives. While I wasn’t in the classroom for long, I am shocked every time I go back to my hometown and meet my old kids. Many of them are excited to see me and tell me how much of an impact I had on their lives. I will freely admit, I miss the classroom sometimes, but am always excited to see their success – though seeing how they have grown also makes me wonder what some of my old friends who lost their battle with cancer would have done if they were still alive. Thinking back, they are very fond memories and something I will never regret. Because of this, I was intrigued when I was asked to read The Priority List: A Teacher’s Final Quest to Discover Life’s Greatest Lessons by David Menache. Once the book arrived, however, I never expected how hard it would be to put his book down. What would you do if you found out you were dying? Many of us have been asked this in the past, but we truly have no clue what to do if we found ourselves in this position. This is exactly what happened to David Menasche. He was living his dream of being a successful teacher and changing the lives of children in his classroom. Then, his life was turned upside down when he found out he was dying of brain cancer, which ultimately stole his vision, memory, mobility, and eventually his dream job. After six years of unsuccessful treatment, he decided to end treatment regimen and make a trip across the US, visiting his old students and seeing how they were faring in life. In The Priority List: A Teacher’s Final Quest to Discover Life’s Greatest Lessons, you will see how this inspirational journey changed his life, how he affected his students, and it will make you stop and rethink your own priorities as you read his amazing journey. As someone who used to be in the classroom, I truly felt for this teacher and thought it was one of the most inspiring books I had read in a long time. Sometimes we forget how much of an impact we have on kids. While I loved the story of him visiting his past students and their success, I also felt sad following the downward spiral with his cancer. Seeing such an inspiring, amazing person dying is something no one wants to see, but it breaks your heart more with his outlook of being worried he didn’t live enough. 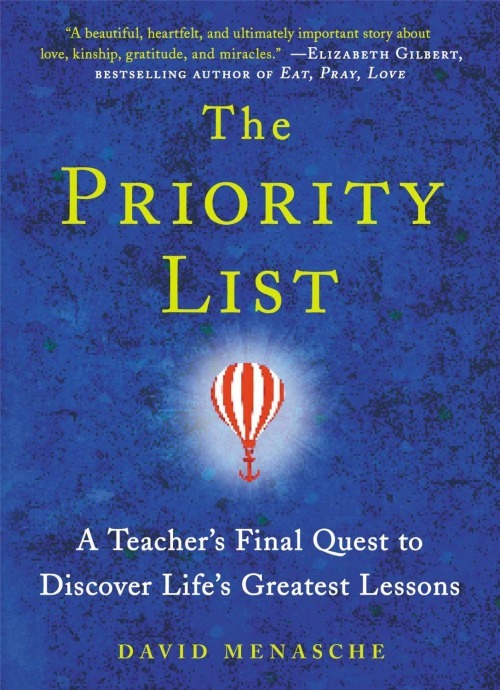 Based on my own opinion of the book, I am very happy to give the Priority List an A rating and consider a great read for anyone who is considering becoming a teacher, or someone who loves reading inspirational books. Would you love to read this inspiring book? Currently, you can purchase The Priority List: A Teacher’s Final Quest to Discover Life’s Greatest Lessons on the Kindle for $10.67 or the hardcover version for $16.26. After you have this book, you will see why I think it is one of the most beautiful and thought-provoking books I have read in years.